"Students, we came too late. Sorry, students. Whatever you say and criticise about us is deserved. My purpose here now is not to ask for your forgiveness. I want to say that now, your bodies are very weak. You have been on a hunger strike for six days, and it's now the seventh day. You cannot go on like this. Starving for such a long time will cause irreparable problems for your bodies, and is dangerous for your health. Now what is most important is to end this hunger strike. I know, you are doing this in the hope that the Party and the government will give a most satisfactory answer for what you are asking for. I feel, our channel for dialogue is open, and some problems need to be resolved through a process. You cannot continue to - after seven days of hunger strike - insist on stopping only when you have a satisfactory answer. You are still young and have much time ahead of you. You should live healthily to see the day that the Four Modernisations (as proposed by China's first premier Zhou Enlai in 1975 in the areas of agriculture, technology, industry and defence) of China are realised. You are not like us, we are already old, and do not matter. It was not easy for the country and your parents to nurture you to reach university. Now in your late teens and early twenties, you are sacrificing your lives! Students, can you think rationally for a moment? Now the situation is very dire as you all know, the Party and nation are very anxious, the whole society is worried. Besides Beijing is the capital, and each day the situation is worsening; this cannot go on. You mean well, and have the interests of our country at heart, but if this goes on, it will go out of control and will have various adverse effects. All in all, this is what I have in mind. If you stop the hunger strike, the government will not close the door on dialogue, definitely not! What you have proposed, we can continue to discuss. It is slow, but some issues are being broached. I just wanted to visit you today and at the same time, tell you how we feel, and hope that you will calmly think about this. Under irrational circumstances, it is hard to think clearly on this. All the vigour that you have as young people, we understand as we too were young once, we too protested and we too laid on the tracks without considering the consequences. Finally I ask again sincerely that you calmly think about what happens from now on. A lot of things can be resolved. I hope that you will end the hunger strike soon and I thank you." - It is now known that Zhao Ziyang (himself a noted economic reformer in 1980's China) was against the imposition of martial law during the Tiananmen protests and was stripped of his power by Party hard-liners for his perceived support of the demonstrators. 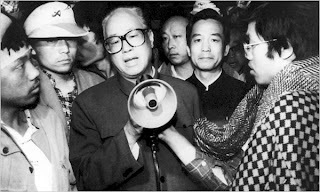 Zhao Ziyang's speech on May 19, 1989 to the gathered crowds at Tiananmen Square would serve as his final public appearance as the government of that time placed him under house arrest until his death in 2005. One of the most powerful images of the past century. It happened this week 20 years ago in Tiananmen Square, Beijing, China. 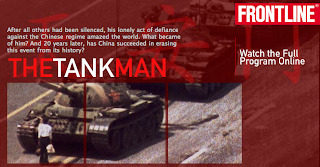 Please follow this link for the BBC News timeline of the Tiananmen protests of 1989.
program of Frontline's The Tank Man. 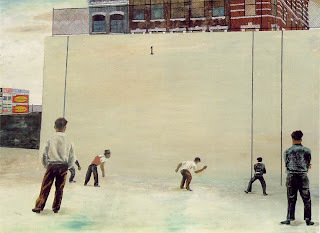 Honestly, when most people speak of The Bronx, NY, they imagine a poor and decaying New York City borough of "Fort Apache, The Bronx" fame that they manage to never step foot in. When pressed, these critics might admit to some better aspects of the borough such as the New York Botanical Garden, Bronx Zoo, Wave Hill, Pelham Bay Park, Riverdale, Bronx High School of Science, Woodlawn Cemetery, Arthur Avenue shops, City Island seafood, Fordham University, Yankee Stadium, etc. They might even give you a point or two for Jennifer Lopez (Jenny from the Block), who grew up in the Castle Hill section of The Bronx. My own family moved to the U.S. and The Bronx in the late 70s, at a time when New York City was going through major financial problems and witnessing some very dark days (sound familiar?). But what does a kid know? I saw everything with rose-colored glasses and was too busy trying to come up with change for another pack of baseball cards or a hot slice of pizza. The truth is it's not as bad as people make it out to be, but there's still much work to be done in the borough. 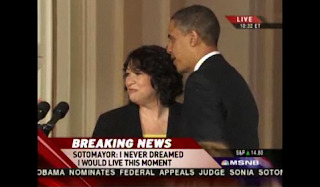 Earlier this week on Tuesday, President Obama took a step in the right direction by nominating Judge Sonia Sotomayor of New York, who was born and raised in the South Bronx, to the Supreme Court. It was an important moment for many Americans as Ms. Sotomayor now has the opportunity to become our country's very first Hispanic justice. What an incredible journey, to have traveled all the way from a public housing project in the South Bronx to the doorway of the Supreme Court. And suddenly for a moment, my own oddball memories all came rushing back to me...classes at C.S. 47 and I.S. 193, Ruben, Sammy, Sean, Blair, Eileen, Barbara, early morning handball, Mrs. Brady's typing class, breakdancing culture, West Farms, St. Lawrence Ave., Parkchester, cross country races at Van Cortlandt Park, bootleg Top Gun and Wrestlemania VHS tapes, and laughing and joking all the way home on the uptown 4 train with Ruthledge and Anthony. Good people and good memories, and I am beginning to hope that good things do indeed come to the good people of this world. As President Obama remarked in nominating Judge Sotomayor: "Well Sonia, what you've shown in your life is that it doesn't matter where you come from, what you look like, or what challenges life throws your way - no dream is beyond reach in the United States of America." "And when Sonia Sotomayor ascends those marble steps to assume her seat on the highest court of the land, America will have taken another important step towards realizing the ideal that is etched above its entrance: Equal justice under the law." 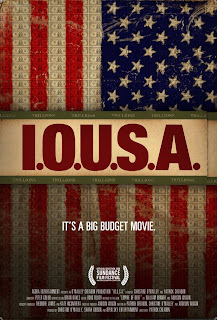 I.O.U.S.A., a documentary movie distributed by the Peter G. Peterson Foundation, does an admirable job in dissecting the key issues surrounding the United States' staggering national debt for the American public to digest. The Foundation's mission statement: Our mission is to increase public awareness of the nature and urgency of key economic challenges threatening America's future and accelerate action on them. To meet these challenges successfully, we work to bring Americans together to find sensible, sustainable solutions that transcend age, party lines and ideological divides in order to achieve real results. Do we care enough about where we are going as a society? Maybe with its newfound vogue, fiscal sanity will find its way to the contemporary art market as well. Take for instance what the influential writer and critic Robert Hughes has written about the artist Damien Hirst - "If there is anything special about this event, it lies in the extreme disproportion between Hirst's expected prices and his actual talent. Hirst is basically a pirate, and his skill is shown by the way in which he has managed to bluff so many art-related people, from museum personnel such as Tate's Nicholas Serota to billionaires in the New York real-estate trade, into giving credence to his originality and the importance of his "ideas". This skill at manipulation is his real success as an artist. He has manoeuvred himself into the sweet spot where wannabe collectors, no matter how dumb (indeed, the dumber the better), feel somehow ignorable without a Hirst or two." 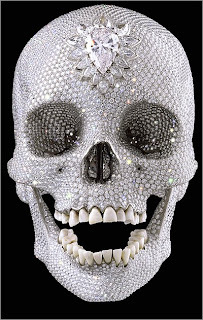 Endnote: Hirst's diamond encrusted skull For the Love of God, 2007, was purportedly sold to an investment group for 100 million dollars, the highest recorded price paid for a single work of art by a living artist. 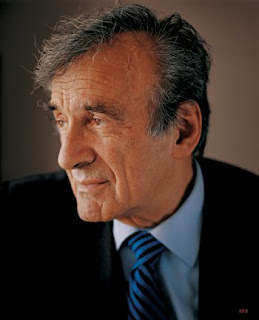 Elie Wiesel, noted writer, educator and Nobel laureate recently published a new novel titled A Mad Desire to Dance (Knopf, 2009). Mr. Wiesel, the author of over 50 books, is of course best known for the acclaimed La Nuit (Night), a memoir of his Holocaust experiences. 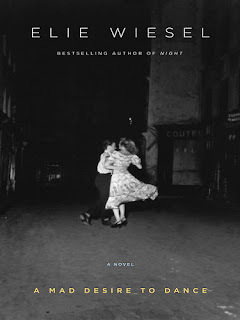 It caught our eyes that the book's designers chose Robert Doisneau's timeless Last Waltz on Bastille Day, 1949 as the cover image. 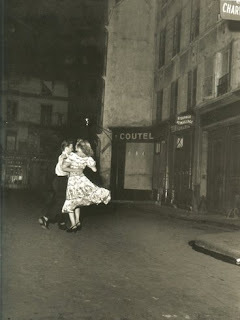 While the novel centers on a Holocaust survivor named Doriel Waldman and his personal despair, Doisneau's photograph was most certainly selected to convey a sense of joy and hope. We are deeply saddened and distressed that we, along with many others, have been the victims of what may be one of the largest investment frauds in history. 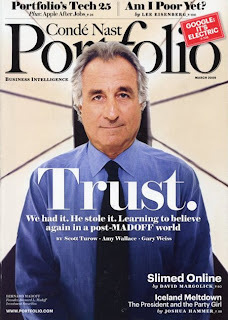 We are writing to inform you that the Elie Wiesel Foundation for Humanity had $15.2 million under management with Bernard Madoff Investment Securities. This represented substantially all of the Foundation's assets. The values we stand for are more needed than ever. We want to assure you that the Foundation remains committed to carrying on the lifelong work of our founder, Elie Wiesel. We shall not be deterred from our mission to combat indifference, intolerance, and injustice around the world. At this difficult time, the Foundation wishes to express its profound gratitude for all your support. Just to stir the pot about media and technology a little more, follow this link to Virginia Heffernan's thoughtful article titled Let Them Eat Tweets in the New York Times. Ms. Heffernan notes that the writer Bruce Sterling recently said "Poor folk love their cellphones!" and he also proposed "that the clearest symbol of poverty is dependence on "connections" like the Internet, Skype and texting." No matter which side of the fence you're on when it comes to modern day connectivity, you have to wonder how many of the updates or conversations we have daily are really necessary or matter. 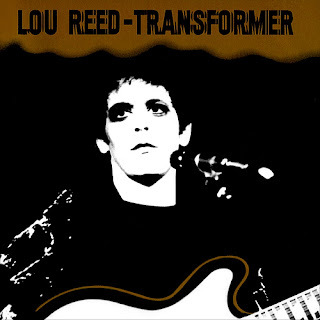 It brings to mind the amusing lyrics from Lou Reed's New York Telephone Conversation (from the album Transformer, 1972). Anyway, we finish this post with Lou Reed's Coney Island Baby from 1976...for no other reason than that it's Lou Reed and it's a special song. We hope everyone finds real love and real connectivity in this world. Artists, critics, scholars, and those who conduct the business of art are often criticized themselves for using an overly difficult vocabulary when describing works of art. Flip through any contemporary arts magazine or look for ambitious artist's statements when you visit gallery exhibitions and you'll get a full dose of the jargon that has come to be known derisively as artspeak. Sometimes though, words and ideas do converge to bring clarity about an artist's intent and the creative process. 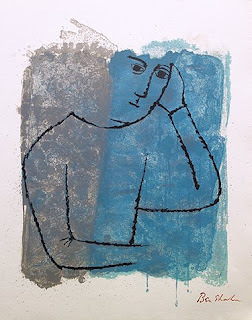 In the case of the social-realist artist Ben Shahn (1898-1969), when he came across the following words written by the German poet Rainer Maria Rilke, the meaningful verses stayed with him and inspired his own output during his lifetime. Alone, now in my thinking, I began to believe that art did, after all, have a mission - certainly not the Beaux-Arts kind of mission, but another one. Its mission was to tell what I felt, to say what I thought, to be my own declaration. I could not accept the current ones; they expressed some other fellow's beliefs and intentions, not mine. Pictures would be my manifesto. Rilke wrote: "I am learning to see; yes, I am beginning to see." How wonderful! No one could take that away from him. That is the great experience of life. No one would take it away from me either. It is tempting to be part of the avant-garde, it is so exciting to be part of a movement, daring and yet secure. But it is an illusion and it creates within the painter a complacent sense of having done things which in truth he has not done. The way to painting is a lonely road, a one-man path. It holds no security; it is not cozy. Every moment of painting is a moment of doubting. The only criterion is the criterion of self, of what one wants, what one thinks he believes, his own shaky philosophy. There are no guideposts, no maps, no geography to tell him that he is on the right path. No friend, however sympathetic he may be, can predict the quality or the validity of the image that the painter hopes to bring forth. The only vindication of his course of action is a realized image, a work of art. I read and was so lured by the manifestos. I avoided them but still with a great nostalgia to participate in the socializing and the ferment that were part of them - of what today would be called "the scene." But I knew they were foreign to me and that in truth there was for me no choice. I had now long ago found in Rilke the passage that came to mean so much to me. Here was a writer about the processes of art who was not telling me what to do, what to think, how to paint. No; he was too engrossed in his own discoveries. He was sharing with me the doubts and the hesitations of art, the probings, the slow emergence of forms. 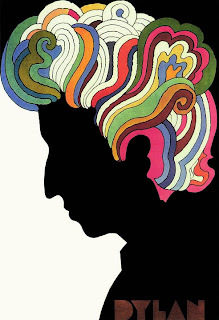 His every line of writing was art, and yet such art was inseparable from its life content. No manifesto could ever tell me more clearly than this one paragraph of Rilke's that art is an emanation from a person; that it is shaped and formed out of the shape and form of that person. In being so acutely personal to him it achieves also a rare universality. Rilke is speaking (is he not?) to the innermost recesses of the consciousness, an area in which we spend so much of our time and expend so much of our feeling, and yet an area that is so remote from communication with our fellow-beings, an area that is, unhappily, increasingly remote from the reaches of art. Created by the art and design team of Anna Tan and Pak So, our blogs are dedicated to sharing the joy, beauty, and humanity of the world we live in. Life is found in the details. 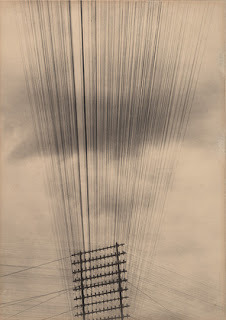 Pak So is an artist, writer, and the Director of Operations at the Howard Greenberg Gallery in New York City. Anna Tan is an award winning Design Director who has successfully completed creative projects for major companies and clients in the travel, arts, entertainment, retail and publishing industries. Pak and Anna are currently producing an upcoming title for Trips of Wonder on the business capital of Tokyo, Japan. Most of us want to reach an end, we want to be able to say "I have arrived at self-knowledge and I am happy"; but it is not like that at all. If you can look at yourself without condemning what you see, without comparing yourself with somebody else, without wishing to be more beautiful or more virtuous; if you can just observe what you are and move with it, then you will find that it is possible to go infinitely far. Then there is no end to the journey, and that is the mystery, the beauty of it. and Anna Tan of Anna Tan Graphic Design.